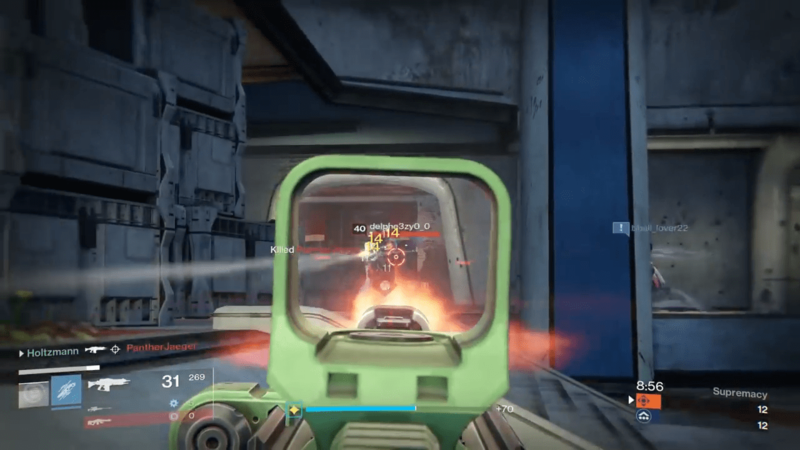 Khvostov 7G-0X is an Exotic auto rifle, obtained from its Exotic Quest. The good: Fun, customizable, full of nostalgia. The bad: Slow reload speed, low base stability and range. Conclusion: A visceral weapon, but ultimately outclassed. The Khvostov is a fantastically anachronistic re-addition to the Destiny universe. Its origins predate the collapse, and so does the design. It’s similar to Russian military rifles used today, and looks ever-so-slightly out of place, in a pleasant way, alongside Destiny’s more futuristic models. The schematics uncovered along the way to its construction describe it as a workhorse rifle, and its appearance suggests the same. The heavy, blocky aspect of the frame and the staccato bark of the firing sound make it feel less dainty and more realistic than most of the other auto rifles found in-game. Similarly, the optional ornaments are grounded and unassuming. It’s a good-looking weapon, if not particularly elegant. The Khvostov is defined by its heavily-customizable perkset. Players can change from full-auto to semi-auto to burst-fire, swap between 450 and 900 RPM firing rates, and pick from a selection of perks in order to prioritize range, stability, or magazine size. There are numerous potential variations, but at its core the Khvostov remains a solid workhorse of an auto rifle. In the first column, the “modernized scope” is the better option. This gives slightly increased zoom and aim assist, which does help the gun lock on to enemy heads. The second column changes firing modes, and allows you change between semi-auto, burst-fire, and full-auto. I tend to stay on full auto, which feels the most natural option in all cases. The third column contains hammer forged, rifled barrel, and braced frame. This is when you can start tailoring the gun to your preferences. When playing PvE, we recommend playing at 450RPM with hammer forged or rifled barrel, if you can handle the the slow reload speed. In PvP, we recommend hammer forged or braced frame, depending on how well you do at controlling the gun’s recoil. The fourth column contains extended mag, counterbalance, and rangefinder. Once more, this will depend on how you play. In PvE, using rangefinder helps you take down enemies at a comfortable distance, and extended mag is a good fit for the 450RPM firing mode, which grants a smaller magazine. Counterbalance is as useful as it always is, and will help you consistently land crits when running 900RPM. Finally, the fifth (yes, fifth!) column changes between firing rates. 450 RPM is a better choice for PVP, and 900RPM is by far the better choice for PvP. Keep in mind that changing the firing mode does not change the archetype of the gun. Once again, this is an auto rifle, and that will not change. The only difference is if you choose semi-auto at 450RPM, in which case you will see exactly one more damage in PvP. While changing the firing mode can help you to handle recoil, it’s better to simply practice with the full-auto mode until you’re comfortable. High levels of available customization and a fun, mobile play-style make this weapon very engaging. It can compete at close and close-mid range, especially when used on unsuspecting targets, making it an effective flanking weapon. PvE combat is still largely defined by deliberate, ranged engagements, or in-the-thick of it high-impact combat, and the Khvostov excels at neither. However, the best way to use this weapon in PvE is to switch it to 450RPM and maximize range. This will let you reliably chain headshots while giving you enough range to stay away from charging melees. Unfortunately, I didn’t gain any game-changing difference while swapping between firing modes, but I do occasionally find it enjoyable to switch to semi-auto at 450 RPM, even if it’s not going to maximize your DPS relative to other weapons. You’re going to want to use extended mag, as this gun chews through ammo. Some players are sure to appreciate the levels of customization available, and I can easily imagine devoted campaigners keeping the Khvostov on hand. That said, you’re unlikely to pick an assault rifle over a legendary scout or a hand cannon – a good roll on a Hung Jury or Imago Loop is just too useful to pass up. Beyond that, there’s simply no reason to use this gun over an exotic that grants a passive bonus, such as the Zhalo Supercell, Monte Carlo, or even Bad Juju and Red Death. In Wrath of the Machine, the Genesis Chain is going to be a better choice due to the “focused firefly” perk and bonus Fallen damage, while freeing up room for the Black Spindle or an exotic sword. The slow reload speed and reduced magazine size when using braced frame exacerbates this weapon’s deficiencies. Whereas the Zhalo and Bad Juju will burn through trash mobs and still help out with majors all while charging your super, the Zhalo’s low base reload speed means that you spend an awful lot of time reloading while backpedaling out of the way of rushing enemies. In PvP, the gun can be quite enjoyable if you’re in it to have fun rather than to maximize killing potential; but it’s currently untenable outside of its 900RPM selection, which renders all that customization fairly impotent. It’s a very visceral weapon, and feeling the sights latch onto an enemy as you mow them down is a great experience. Playing with the innumerable variables does make the Khvostov feel like your gun, despite its fixed rolls, and the intrinsic “lightweight” perk encourages users to run-and-gun rather than watch and wait. 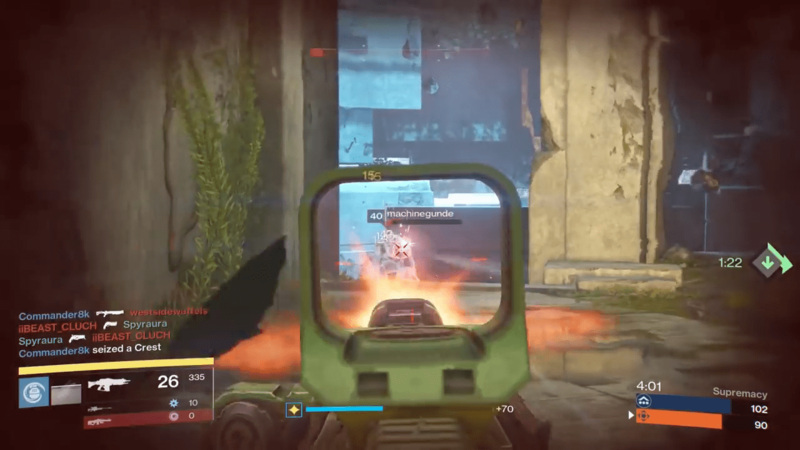 Unfortunately, auto rifles simply aren’t effective in the Crucible right now. That’s true of the 900RPM mode, and even more so of the 450RPM mode. Like all “bullet hose”-type rifles, the Khvostov is entirely dependent on stability perks to make it usable, while the low range means that users will find themselves at the mercy of The Last Word, shotgun rushers, or high-ROF pulses. To win your primary battles, you’ll have to reach and stay within the optimal range while doing your best to ensure you get the first shot off in order to maximize flinch. Your best bet is to use this rifle in a slightly more frantic 6v6 game mode, as you’ll have more opportunities to catch opponents off guard. In smaller engagements, good players will poke-shot you with hand cannons or pulse rifles, and you’re unlikely to be able to get close enough to do them serious damage. This doesn’t mean that the gun is unusable, and in its 900RPM mode it’s a viable weapon. It’s very possible to surprise (and melt) enemies when the Khvostov is combined with a high-mobility loadout, and above all, it is fun to use. It’s hard to overlook that factor, but it’s harder to ignore its competitive deficiencies. A slow reload time, low stability when optimized for range, and average time-to-kill means that you spend too much time vulnerable to other targets. The lack of a useful exotic perk means that the Khvostov is ultimately outclassed by other exotic primaries. This auto rifle comes from one of the most enjoyable quests in Rise of Iron. It’s absolutely worth acquiring the weapon just to enjoy the missions along the way. 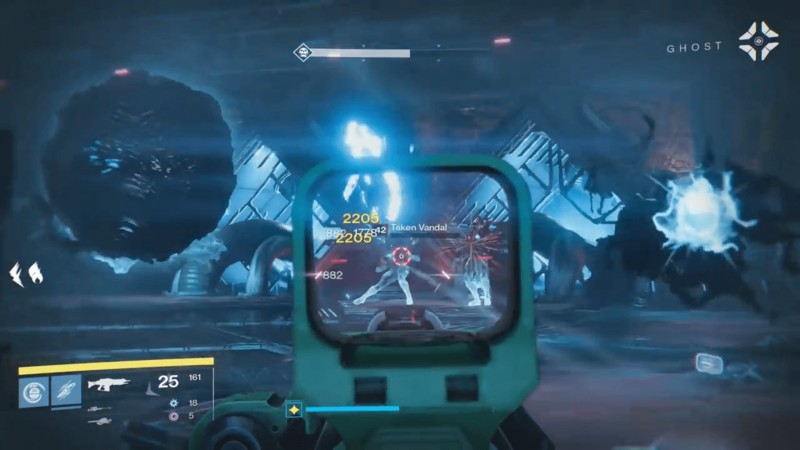 At 900RPM, the gun is quite usable in Crucible content, and if you unlock the Khvostov early in your campaign, it will likely carry you through the beginning of your quest towards LL400, regardless of whether you’re playing PvE or PvP. Unfortunately, it excels at neither. The ability for customization, while fun, won’t change the way the gun behaves at a fundamental level – it cannot become a scout or pulse rifle, regardless of firing mode. That means that all of this fun stuff is essentially wasted space for the long-term players who, at this point, have already identified their most effective weapons for story or Crucible combat. Hopefully, auto rifles receive a buff at some point in the future. Currently, despite its high potential for modification and the thrill you’ll get from using it, your exotic slot is better suited for another weapon. For PvP this weapon earns a 8/10 and for PvE a 6.5/10.